Scholarly but lively biography of the Italian-born queen who ruled France as regent during 30 years of bitter religious warfare. Catherine (1519–89) was only 14 when she married the French Dauphin (crowned Henri II in 1547), but she’d already been very nearly murdered by opponents of her cousin Pope Clement VII. Being scorned by the French nobility as an Italian upstart merely sharpened the political skills of a young woman who wasn’t pretty but had learned how to be charming—and how to keep her thoughts to herself. Yet Catherine’s centuries-old reputation as a murderous schemer is undeserved, argues first-time biographer Frieda: ruthless, yes, but no more brutal than anyone else embroiled in the struggle between Catholics and Protestants that racked 16th-century France and threatened to destroy the Valois dynasty. Henri’s untimely death in 1459 left Catherine with a ten-year-old son on the throne; two more underage sons would inherit the crown while she checked the ambitions of the powerful Guise and Bourbon families. Yes, Frieda acknowledges, Catherine did plan the 1572 assassination of leading French Huguenots that has tarnished her name ever since, but the St. Bartholomew’s Day Massacre was “intended as a relatively small-scale surgical operation,” though the passions of the Catholic masses turned it into a full-scale bloodbath. In fact, Frieda demonstrates, Catherine was a religious moderate who repeatedly offered toleration to the Huguenots until she became convinced they weren’t just heretics but traitors. Seven months after Catherine’s death, fellow pragmatist Henri de Bourbon abjured Protestantism and ascended the throne and, with the 1598 Edict of Nantes, ended the nation’s fratricidal conflict. If any of her sons had been that adept, Catherine would be remembered as a patron of the arts, enthusiastic huntswoman, and thrower of great parties instead of “the Black Queen” of St. Bartholomew’s Day. 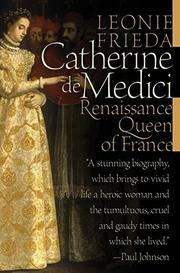 Persuasive rehabilitation of Catherine, not as a nice woman, but as a shrewd leader who did what she had to.